Training camp report dates: rookies (July 22) and veterans (July 27). Location: University of Phoenix Stadium in Glendale, Arizona. Most important position battle: Quarterback. Cardinals head coach Steve Wilks had said Sam Bradford is his starter, but he’s also left the door open to competition, and Arizona got what I consider to be a steal in Josh Rosen with the 10th overall pick of this year’s draft. Deemed the most pro-ready quarterback in the 2018 class, Rosen is expected to acclimate quicker than most at the position, and he could come in handy if Bradford can’t stay healthy. Bradford doesn’t have the best track record in that department, and while few are expecting Rosen to win the job out of camp, the team will be able to gauge his readiness for starting duty based on how he transitions to the pro game in camp. If it’s a closer race than expected, that would bode well for the Cardinals, in case they need to turn to Rosen earlier than they anticipated. Newcomer to watch: WR Christian Kirk. Larry Fitzgerald has flirted with retirement, and Arizona just watched Jaron Brown and John Brown depart for other squads, putting Kirk, a second-round pick in this year’s draft, squarely in the spotlight. Should he answer the bell, Kirk has an opportunity to make an early impact, especially with few proven options outside of Fitzgerald. Sure, the Cardinals signed Brice Butler, but this isn’t a deep group (Arizona’s signing of Greg Little should serve as an example of this). Kirk’s ability to contribute — especially in balancing Arizona’s passing attack by adding an underneath threat — can help Bradford and/or Rosen plenty this season as the Cardinals attempt to improve on an 8-8 2017 campaign. Looming camp question: How long does Sam Bradford keep the starting QB job? We don’t mean to make this too much about the quarterbacks, but it’s the most important position in the game — all Arizona needs to do is look back at the last half-decade for an example. When Carson Palmer was healthy, QB was a point of strength for the club, but when No. 3 wasn’t lining up under center, it was the weakest spot on the team. With Palmer gone to the calmer waters of retirement, the position is again unsettled, even with Bradford arriving via free agency. When healthy, Bradford is an effective quarterback. But we all know good health isn’t certain with him, as he’s played a full 16-game season just twice in his seven-year career, and he played in just two games last season due to a knee injury he’s still working his way back from. Does the pro-ready Rosen make a start before the halfway point of the season? And if so, what’s the reason: poor play on the part of Bradford, or injury? This might not be an issue that arises in camp, but the development of Rosen and health of Bradford are incredibly important points of focus in this camp and the regular season. Location: University of California in Irvine, California. Most important position battle: Outside linebacker. OLB is the position with the most uncertainty for the Rams entering camp, following the offseason departure of Robert Quinn. Los Angeles shipped Quinn out to the Dolphins, and Connor Barwin, who started 13 games for the Rams last season, remains a free agent. They’ve opted to fill the gaps with younger, somewhat unproven players. Samson Ebukam has the inside track at this position as of now, thanks to his contributions in spot duty behind Barwin, but he could face competition from rookie Ogbonnia Okoronkwo. The former Oklahoma star was explosive at times with the Sooners. However, he faces an uncertain timeline after undergoing foot surgery in May. Ebukam will see an increased advantage if Okoronkwo isn’t ready in time to participate in the majority of camp. Fellow rookie Trevon Young stands to give Matt Longacre a run to start at the other outside linebacker position, as well. With two rookies and two unproven veterans listed as the first four vying for two jobs, there are plenty of question marks here. Of course, the Rams boast a front three of Aaron Donald, Ndamukong Suh and Michael Brockers, so they might not be counting on the same production out of the OLB position that they did in the past, but it’s definitely still one to watch closely. Newcomer to watch: WR Brandin Cooks. 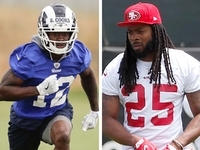 Thanks to GM Les Snead’s furious offseason, we could go in a variety of directions with this choice: corners Aqib Talib and Marcus Peters seem like good candidates, as does defensive tackle Ndamukong Suh. We’ll go with Cooks instead. He’s on his third team in as many seasons and is still playing on his rookie contract. Cooks is a deep threat who stands to really shine with big-armed quarterback Jared Goff throwing to him. The Rams were a dynamic, high-flying offense, even without a massive contribution from Sammy Watkins last season, and if Cooks matches his production from each of the last three seasons, they’ll become even more dangerous in the passing game than they were in 2017. How quickly he establishes a rapport with Goff will go a long way toward determining just how many points the Rams can put up on a weekly basis in 2018. Looming camp question: How do all of the new pieces fit under Wade Phillips? If there was ever a defensive coordinator properly equipped to handle such turnover with one defensive unit, it’s the wise Phillips. But even with the big-time additions of Talib, Peters and Suh, can the Rams make up for what they’re losing in Quinn, Barwin, Alec Ogletree (traded to the Giants) and Trumaine Johnson (signed with the Jets)? That’s a lot of production and veteran leadership to replace. How well the new pieces jell and how quickly the new outside linebackers get up to speed will significantly impact the Rams‘ performance. Location: SAP Performance Facility in Santa Clara, California. Most important position battle: Wide receiver. Beyond Marquise Goodwin and Pierre Garcon, the rest of the depth chart at the position is wide open. Aldrick Robinson returns as the 49ers‘ third receiver, but after a season in which he caught just 19 passes for 260 yards and two touchdowns, he faces competition from 2018 second-round pick Dante Pettis. The former Washington Husky was his team’s best receiving option by a long shot, displaying a propensity to catch and run and also beat most corners in one-on-one matchups inside the red zone. With Pettis checking in at 6-foot-1, the latter task will be more difficult in the NFL, but when you factor in his punt-returning ability (Pettis owns the record for most career punt return touchdowns in FBS history), it seems Pettis could make an impact quicker than most expect. That could include beating out Robinson for the third receiver position (not including slot man Trent Taylor). The receiver position takes on added importance for a Niners team that will be led by QB Jimmy Garoppolo, who signed a five-year deal worth $137.5 million in February, for a full season for the first time. Newcomer to watch: RB Jerick McKinnon. GM John Lynch dumped truckloads of money on McKinnon, who’s a threat as a runner and receiver. McKinnon stands to get plenty of looks on all three downs. His acclimation to the offense and playing alongside Garoppolo will determine just how successful the promising Niners can be on offense, and how wise Lynch was in bringing him in at an annual rate of $7.5 million. Looming camp question: Will Richard Sherman make a significant impact? Sherman comes to San Francisco on a bet-on-me deal that was a low-risk agreement for the 49ers, but there’s still that part about playing the games. Sherman brings plenty of big-game experience to a defense that hasn’t seen many of those in recent years, but will he return from his Achilles injury near the level at which he played for so many years in Seattle? San Francisco will be counting on him to hold down a starting corner spot for now, and with little reliable depth behind him, his performance looks like it’ll be more meaningful than that of the average veteran addition. Location: Virginia Mason Athletic Center in Renton, Washington. Most important position battle: Running back. Seattle has ranked in the bottom 10 in the league in rushing in each of the seasons since Marshawn Lynch entered his temporary retirement. Part of that has been due to a shoddy offensive line, but the myriad backs to tote the ball also haven’t done much to make the situation any better. Knowing this, the Seahawks selected Rashaad Penny, a volume-based back who appears ready to shoulder the load, in the first round of this year’s draft. However, the reviews of second-year back Chris Carson, who’s healthy this time around, have been sterling. Coaches have raved about how good Carson looks, and it shouldn’t be a surprise if he comes into camp with a full head of steam after receiving an offseason challenge via the selection of Penny. Does one RB emerge as the guy, do they pair to create an exciting one-two punch, or will neither separate himself as a potential weapon? With a defense that saw plenty of departures, the rushing attack takes on added importance for the Seahawks. Newcomer to watch: RB Rashaad Penny. We just discussed Penny above, but he’s the newcomer to watch because the RB situation has been that bad for the Seahawks in the last two seasons. Penny has a fairly unique opportunity to grab the starting job by the horns and establish himself as the future at the position in Seattle. If he doesn’t, Seattle’s offense will remain confounding and frustrating to watch, with Russell Wilson left to play hero ball. A rookie’s camp is usually the hardest in his career; Penny’s approach and performance will be a focal point as expectations materialize for this team, at least offensively. Looming camp question: Can the Seahawks overcome the many defensive departures? Michael Bennett, Cliff Avril and Richard Sherman are gone. Kam Chancellor believes he’s played his last game. Sheldon Richardson moved on after one year with the team. Those are significant contributors to a unit that has been one of the league’s best for the past several years. Then there’s Earl Thomas, who’s seeking a new contract and holding out. Seattle can lean on the presence of veterans like Bobby Wagner and K.J. Wright, but on paper, this looks like an inexperienced group that is set to take its lumps in 2018. How quickly can the replacements adjust to their new roles? Frank Clark has a decent amount of experience, starting 12 games in place of Avril last season. The new and/or younger guys — Rasheem Green, Barkevious Mingo, Shaquill Griffin and Dion Jordan, among others — will have to step up.